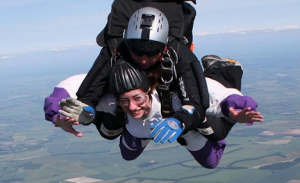 Is raising money for charity by jumping out of a plane impressive or crazy? A little of both if you ask Accountant Vala G., Accounting Supervisor Barrie K. and Intern Gwenan P. from Enterprise Southwest England, who all went skydiving to raise funds for the U.K. Pituitary Foundation. Vala learned about the opportunity when staff from the Pituitary Foundation visited their office. “I like trying new things and thought skydiving would be fun. I did have some doubts when I was hanging out of the plane, but by then it was too late,” says Vala who convinced Gwenan and Barrie to jump with her. The trio would like to thank the Pituitary Foundation for the opportunity as well as their Enterprise team and everyone who sponsored them. They would also like to thank everyone who came to the airfield to show their support the day they made the jump. “We couldn’t have done it without them,” says Vala.